The Big Top goes up. 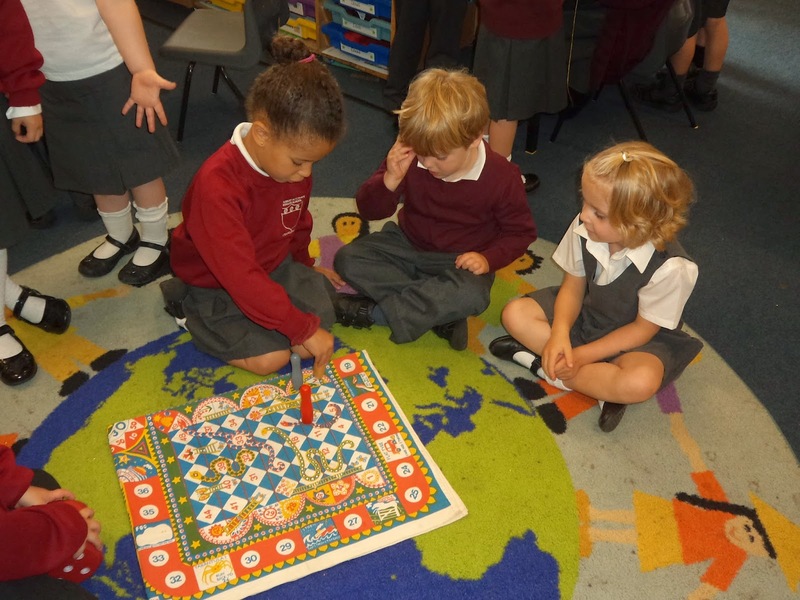 A quiet game of snakes and ladders. 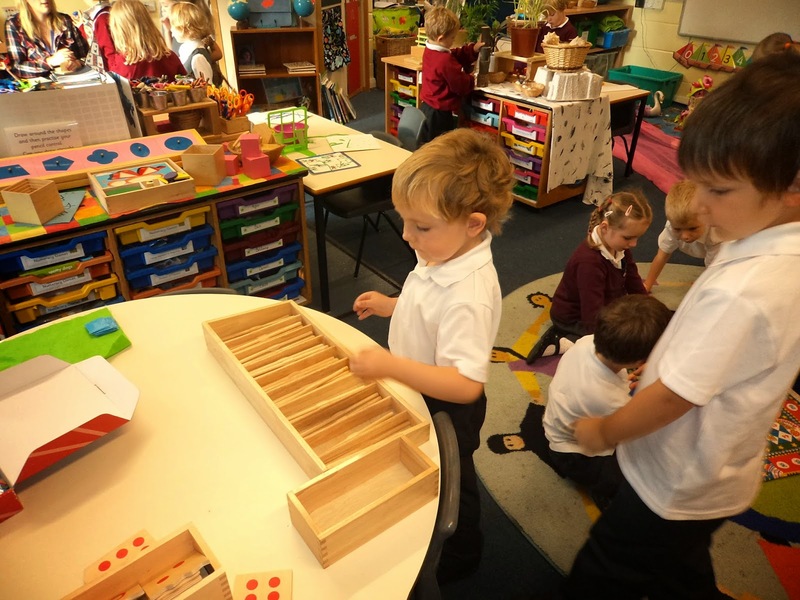 Matching loose quantities to numerals using the spindle box. Enjoying the chance to draw and write on huge pieces of cardboard. 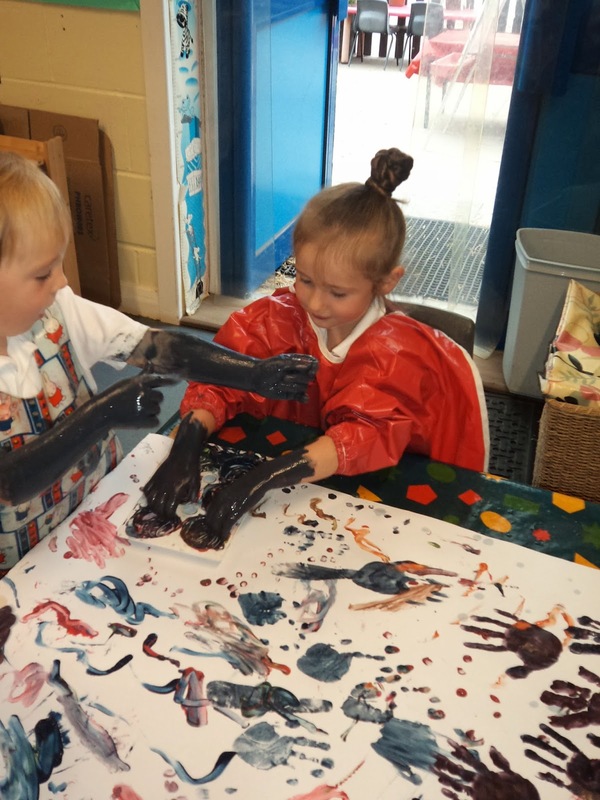 Finger painting...or was it hand painting...or even arm painting? At the end of the school day it is important that the KS1 teachers and children have clear access to get out onto the playground. Please can we ask parents to stand WELL BACK from the bottom corridor access opening, behind the middle yellow line please. There needs to be enough space for the whole class to come out onto the playground, and a clear view for the teachers to see the parents. Foundation parents should MOVE INTO THE FENCED OFF AREA just as the 3pm bell sounds, so making more space on the playground for KS1. We thank you for your co-operation in making the end of the day procedures run more smoothly. Boys Football – Thurs 16 October, Stradbroke HS; Cross Country – Mon 20 Oct, Framlingham College; Netball – Friday 28 November, Stradbroke HS; Quicksticks Hockey - Tues 11 March, Debenham High School; Swimming Gala - Weds 18 March, Framlingham College; Touch Rugby - Thurs 23 April, Diss RFC; Girls Football - Fri 1 May, Stonham Aspal; Girls Kwik Cricket - Mon 8 June, Stradbroke CC; Kwik Cricket - Mon 15 June, Worlingworth CC; Athletics - Thurs 2 July, Thomas Mills High School. The perfect chance to meet the committee and get a better understanding of what they do. The Friends are on the lookout for new committee members and helpers – you will receive a nomination slip a few days before the AGM – so if you have some new and exciting ideas or if you would just be happy to help out at events then please come along and have a chat the Friends. THURSDAY 2 OCTOBER (Census Day), please. The menu for this Thursday is Roast Pork and Sticky Toffee Pudding. We hope you can encourage your child to have one this day, thank you. Bring along items you don’t want and swap for ones you do! Broken electronics, furniture, toys, machinery etc? We will try to mend them for you. Have a clear out & get new items without spending any money. Fairtrade Tea & Coffee available. 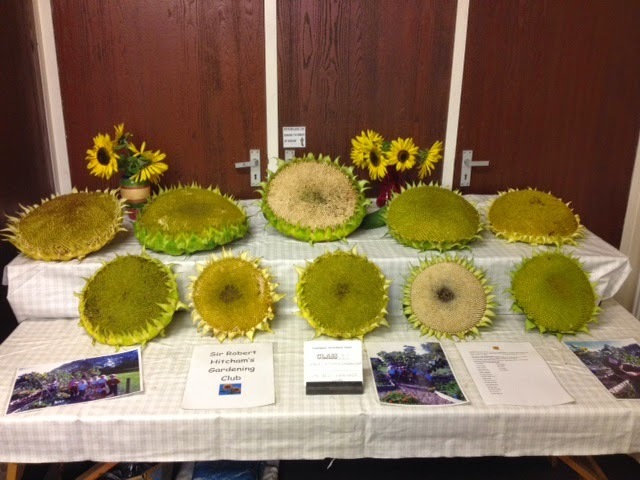 Our Gardening Club entered their home grown sunflower heads in the Framlingham Horticultural Society Annual Show recently. They were succesful in scooping two 1st, a 2nd and a 3rd prize! Well done to the whole club for their brilliant effort and to Mr Seeley and Mr Duggens the volunteer parents who help run the club with Mrs Hopkins and Mrs Eyles. The second FlipSide Festival will take place at Snape Maltings, Suffolk, over the first weekend of October 2014. Literature, art, music, food and drink, children's events, dance, cooking demonstrations, capoeira and football will all be celebrated. Our school Gardening Club recently won a series of awards in a local competition. Members of the Framlingham Rotary Club came into our assembly to give free dictionaries to every pupil in year 6. They also spoke about some of the work that the Rotary Club does to help people around the World. To find out more - click on logo below. We are still outstanding over 80 pupil data sheets. Please return by WEDNESDAY 24 SEPTEMBER and remember to sign them at the bottom! Parents of Year 6 will have received a letter from SCC regarding High School applications. Please be aware that applications should be made on-line or using the form, which should be returned to the Admissions Team, Ipswich at the address on the form (not to the school office) by FRIDAY 31 OCTOBER at the latest. If you are taking your child out of school to go to Thomas Mills Open Day on Wednesday 1 October, please remember to sign them out (& in again) at the office. With this letter please find a wallet size orange card with details of the school number to call when you need to report your child’s absence, we hope you will find these helpful. We had published that Foundation would have a Harvest Service at St Michaels on Friday 17 October, however there has been a change to plan, and there will not be a service there now. More information about the replacement plan will follow. EATs catering have an immediate vacancy for someone to do washing up in our school kitchen, for 1 to 1.5 hours a day, during term time only. The head of kitchen advises that it is hard work. No experience necessary, training will be given. If you are interested, please contact the school on 01728 723354 and speak to Mrs Chapman in the kitchen. Our school has been very fortunate to have been offered an opportunity for 26 KS2 children to take part in the ‘Big Sing’ with 800 children from schools in Suffolk, to be held at Snape Maltings. The event is taking place on Friday 28 November during the school day. With only 26 spaces available they will be allocated in the order in which we receive your reply slips back in the office (please do not give to the class teacher else we will not be able to keep in order). Please apply using the letter sent home with this today by Friday 26 September. THURSDAY 2 OCTOBER AS THIS IS OUR CENSUS COUNT DAY. Sadly, we have not had a big enough response from parents to become Parent Council Representatives for their class. 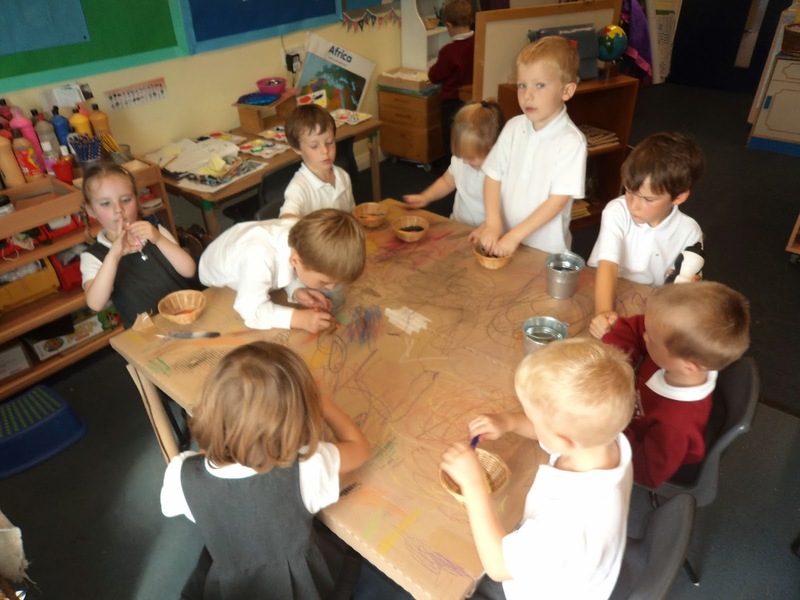 Please can we encourage you to read the letter (click on link below) and if you feel you could contribute to the school by way of becoming a parent council representative then we would very much appreciate it. by this Friday if possible. EATs catering have an immediate vacancy for someone to do washing up in our school kitchen, for 1 to 1.5 hours a day, during term time only. The head of kitchen advises that it is hard work. No experience necessary, training will be given. If you are interested, please contact the school on 01728 723354 and speak to Mrs Chapman in the kitchen. With this letter please find a brown envelope that contains your child’s personal and emergency information. Please read the letter enclosed then carefully check and edit the form, especially for emergency contacts and medical details. Please SIGN THE SHEET at the bottom and return it to the school office by Wednesday 24 September. anti-hystamine etc) , it is essential that you ask at the office for a form. 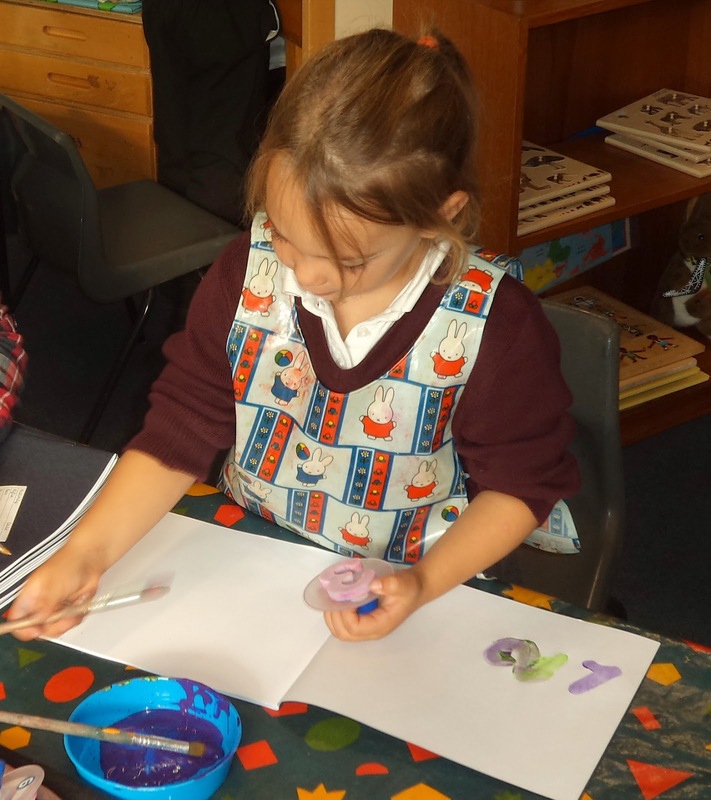 The ‘Medical Needs’ policy can be found on the school website. VOLUNTEER READING HELPERS IN CLASS... CAN YOU OFFER SOME TIME? We are very grateful to all volunteer helpers who have already registered with us this year. 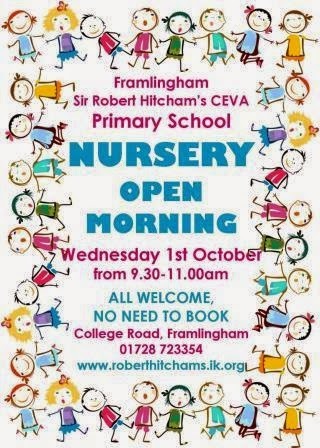 Some classes have no volunteers yet, so we have a number of sessions where help is required. Volunteer help is a very important part of school life and if you feel able to offer anytime, we would be pleased to hear from you. To help in school you will need to have a DBS check which can be arranged through the office. Orders for the accompanying leaflet should be returned by Friday 26 September. We are very lucky that the local Rotary Club support our school every year by donating a fabulous dictionary to all children in year 6. These will be presented in assembly this Wednesday. We are very grateful to the Rotary Club for this generous donation. Those in the second Bikeability group should remember their bikes on Thursday & Friday. Please take them to the BACK playground ready for their session. They can be left in the Y6 courtyard overnight; you may wish to bring a carrier bag to cover the saddle. Gardening club are entering ‘The Best Sunflower Head’ into the Framlingham Horticultural Autumn Show this Saturday at the United Free Church Hall from 9.30-11am. Just to remind parents who are brand new to the school to come along on Thursday 18 September at 2.30pm to the school hall, where there will be a welcome from Mrs Picton with tea and cake! This new multi-sport club is where children learn skills from a number of sports. Each week will focus on a different one, and will include a fun warm up, games to learn skills and matches at the end. Sports may include: Football, Hockey, Tennis, Tag-Rugby, Athletics, Fencing, Netball, Dodgeball, Handball and many more. Book using the form provided last week or ask at the school office. If you have a child born between 01/09/2010 and 31/08/2011 then please collect a letter and form from the office to apply for a Reception place for September 2015. YOU WILL NOT BE ALLOCATED A RECEPTION PLACE UNLESS YOU SUBMIT A FORM. Please note they must be returned to the Admissions Team at SCC either on-line or to the address on the form (not to the school office) by THURSDAY 15 JANUARY 2015 at the latest. If you have any admission enquiries please speak to Mrs Miller in the office. As part of the SCC ‘Wider Opportunities’ scheme we have Clarinets for all pupils in class PLDD. Over this year the children will receive whole class music lessons on a Wednesday with Miss Cochrane, a tutor from the County Music Service. After a few weeks the children will be able to take the instruments home on loan to practice. Parents will be required to complete a loan agreement form and return it to the office before your child takes the instrument. Forms will be handed out shortly. We would like to remind parents to provide their child with a filled water bottle for school; ideally with a ‘sports cap’ that will not leak in book bags. We have water fountains in 3 activity areas and on the playgrounds so children may re-fill their bottle if they need to. PLEASE NOTE the indoor water fountains CANNOT be drunk from directly, which is why a water bottle is necessary. NO SQUASH in bottles please, just water. 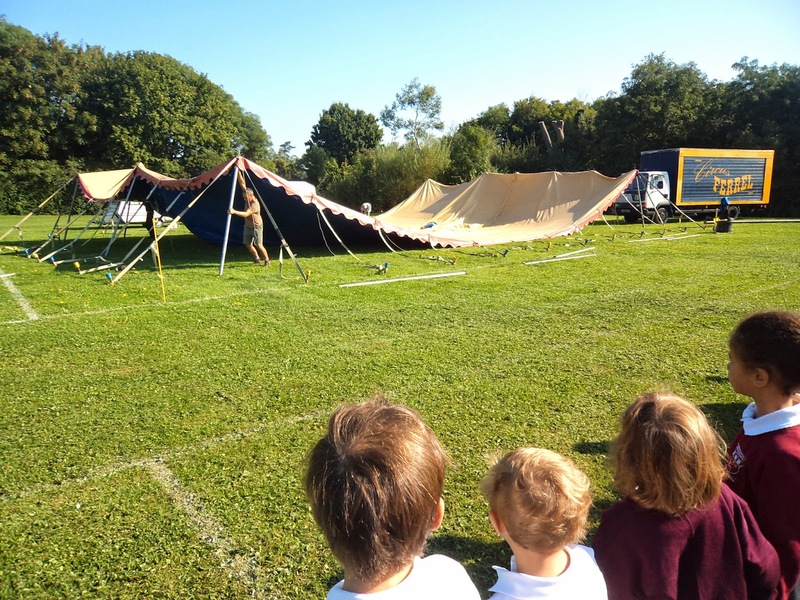 The inclusion of details of extra-curricular, local and out-of-School activities in this newsletter or in leaflets that we distribute in no way implies that they are supported or endorsed by Framlingham Sir Robert Hitcham’s CEVAP School, its Governors or any member of Staff. Parents are advised to make the appropriate enquiries regarding supervision, insurance and other matters.